He was born Juan de Yepes y Álvarez, circa June, 1542, the youngest of three sons to a noble family of Fontiveros in old Castile (c100 miles northwest of Madrid). His father was a wealthy silk merchant, his mother a poor weaver girl. The family elders disowned John’s father for marrying beneath his station and he died shortly after Juan’s birth. At age 9, Juan joined his mother and siblings in moving northeast to Medina del Campo. He was boarded in an orphanage school from age 10. When he was 12, he fell into a deep well and was saved from sinking and drowning by finding a piece of wood to hold onto that came to him after he prayed to Mother Mary. She had earlier saved him when, as a tiny boy, he had fallen into a pond at Fontiveros. Rather inept in apprenticing as a carpenter, wood sculptor and then printer, from 1557 onward John worked compassionately as a hospital nurse among advanced, horrible cases of syphilis. Beginning in 1559, still working as a nurse, he made use of the chance to receive a higher education in Catholic lore and the humanities at the Jesuit college in Medina del Campo. In 1563, the quiet, shy, intensely pious young man entered the Carmelite Catholic religious monastic order. From 1564 to 1568 he studied theology at the famous university of Salamanca, with its 7,000 students and eminent professors. Juan de San Matías, as he was now known, was ordained a priest in 1567. He was 25. In summer 1568 Fray Juan joined the illustrious and dynamic saint Teresa of Ávila (1515-82) at the Carmelite priory of Medina; the two set off with Teresa’s nuns northward for Valladolid, where she was to establish a convent of her new Discalced (“shoeless”) Carmelite reform movement. The Carmelites had originally been founded as a community of hermits in Palestine in 1185, but in the next century had transformed into one of the four orders of itinerant, mendicant friars (including, most notably, the Franciscans and Dominicans). In 1432 the Carmelites adopted a more lax way of life, which prevailed until Teresa’s reform, which based itself on an older, stricter “rule of St. Albert” from 1247. In addition to stressing poverty, strict enclosure, and reduced hours of sleep, one of the austerities introduced by Teresa and her nun-colleagues was a special kind of frequent if not total “fasting”: abstention from animal flesh—i.e., they ate only a spare vegetarian diet. Above all, these Discalced Carmelites put a special emphasis on the contemplative life of solitary, meditative “mental prayer” over communal vocal prayer. The holy friars’ presence soon attracted many visitors, including John’s mother, brother and sister-in-law, who helped them in doing manual labor chores. John’s preaching in town on the holy life of joyous surrender to God and interior prayer drew a number of men to join the friars. So much so that after 18 months, the burgeoning band had to move to a larger building at Mancera, a nearby village. Meanwhile the Discalced Carmelite reform was spreading, raising up many houses in Spain and beyond. At one point Fray Juan was sent by Teresa to bring sanity to a situation at the new priory at Pastrana, 40 miles east of Madrid, where friars and townsfolk had become too enamored of an unbalanced, overly-penitential woman of visions and miracles, Doña Catalina. In April 1571, John was appointed rector of a Discalced Carmelite college at the university of Alcalá near Madrid; but with John’s shy personality and preference for meditation over friend-making and fund-raising, it didn’t prosper. In September 1572, John was brought by Teresa to serve for the next five years as a confessor and spiritual director, along with another friar, for the 130 nuns at the Convent of the Incarnation in Ávila. Teresa had spent over 20 years here before she launched her reform. The nuns violently, vehemently resisted her being appointed by a papal official as their new abbess. But Teresa’s loving warmth and natural humility won them over, and with John’s help, the spirituality of the majority of the women blossomed. Fray Juan took up residence with another friar in a small house adjoining the convent (on the grounds of an old Jewish cemetery where lay buried Moses de León, author of the foundational kabbalist work, the Zohar). Though their work went splendidly well at the Incarnation Convent, “the fame and success of Teresa’s reform had raised against her a host of enemies of whom the most bitter belonged to the unreformed body of her own order,” says Brenan. This included Fr. Rubeo, the Carmelite general superior, who reversed an earlier approval of the Discalced reform and put all their houses under Calced Carmelite rule, denouncing the reform friars and nuns as sinful rebels. Yet the papal nuncio and king still approved of the reform. Juan was kidnapped at one point by members of the anti-reform Calced Carmelites who didn’t want to see their lax, easy lives challenged; he was imprisoned at Medina del Campo for a few days until the nuncio’s order released him and some other captive friars. But then the nuncio died and was replaced by a man hostile to the reform. The reform friars were all to resign any offices held and turn them over to the Calced. None obeyed. John and his friar colleague at the Incarnation Convent were ordered to return to their own former houses. They refused and had the further audacity to support the candidacy of Teresa (then at Ávila) for re-election as prioress of the convent while the laxer group of nuns and male officials wanted someone else. On Dec. 2 or 3, 1577, John was captured by an armed posse and incarcerated in a 6x10 foot dungeon-like closet at the Carmelite monastery down in Toledo. Teresa wrote impassioned letters to the king and the archbishop to free him, declaring that John was and had always been a saint. But to no avail. John was accused before a tribunal of rebellion and disobedience, terrible sins. He replied that he was only following the direction of the apostolic visitor, his immediate superior. He spent the next nine months in hellish conditions—damp frigid cold that winter, stifling heat in the summer, darkness which badly strained his eyes (the only opening was a two-inch horizontal slit near the ceiling), lice infestation, dysentery from the stale scraps of sardines and bread, and vomit-inducing stench due to the fact that his hateful jailer would only change his waste bucket every several days. Not least was the constant humiliation and frequent torture from fellow “Christian” friars, who took him out a few times each week into the rectory at mealtimes, where he was made to kneel like a dog and endure much verbal scorn and bodily flogging and caning for daring to help launch the reform with Teresa. Many of the younger friars revered him as a saint, but their strict vows of obedience rendered them powerless to alleviate his condition. The period was especially hard on Juan because his own great humility made him begin to seriously doubt himself—perhaps he was only a stubborn rebel, sinfully proud in helping Teresa. Such thinking only increased his anguished sense of isolation. Yet it was during this Dark Night of the Soul (he apparently coined the phrase), this period of being stripped of all material and spiritual consolations, this being “totally undone and re-fashioned in God,” that Juan issued forth the early verses of some of his major poems. A new jailer had come in after six months, and given John a fresh tunic and a pen, ink and small notebook for “composing a few things profitable to devotion.” Juan fell into ecstasy one day contemplating the deeper spiritual significance of a love song he heard a young man singing in the city street: “I am dying of love, dearest. What shall I do? –Die.” The first part of his Spiritual Canticle poem and other verses soon followed, and more flowed out over the next several years. Poetry for Juan was not an art-form but a vehicle to express, using the typical medieval “bridal mysticism” themes, his intense realizations of the transpersonal God, his love for the personal Lord, and the blazing power of Spirit, which had stoked a profound fire in him, overcoming the interior and exterior darkness of his dire situation. In August of 1578, a disconsolate and disabled Juan enjoyed a vision of Mother Mary, who had twice saved him as a boy from drowning, now “filling the cell with her beauty and brilliance, and [she] announced to him that his trials would soon be over and that he would leave the prison.” In mid-August, Juan was lucky to escape from his hell-hole in the wee hours of a full-moon night, dismantling at last the cell’s padlock with a needle and thread given by the jailer, and making use of a fabric rope he had fashioned with some scissors and carpet-strips also given by the jailer, to slide down over a balcony onto a high wall, narrowly avoiding fatal injury. In his terribly weak state, he found help again from Mother Mary to somehow scale a remaining wall and find himself on the street beyond. After taking cover, first at a tavern and then the front hall of a caballero’s mansion, John found shelter the next day at a Discalced Carmelite convent. The good nuns smuggled their gaunt, disfigured guest off for six weeks of recovery at the hospital and then private home of Don Pedro de Mendoza, a wealthy friend of the reform. In early October 1578 Juan made the difficult, 100-mile donkey ride to Almodóvar for a chapter meeting of the Discalced Carmelites. All were shocked to see the emaciated appearance of the 36-year-old friar, “like a dead man, with nothing but skin on his bones, so drained and exhausted he could hardly speak.” For safety, he was made temporary head of a priory-hermitage off at remote Calvario. It lies at the eastern border of Andalusia in southern Spain on the upper flow of the Rio Guadalquivir, amidst rocky hills covered with pines and aromatic shrubs. At this simple religious house, a converted farmhouse with a few acres of orchard and farmland, and a tree-shaded spring, John spent the next eight months until June 1579, probably the happiest time of his life. So every Saturday, John and a companion trudged the six-plus miles to the convent, where John heard private confessions all day into the next, and celebrated mass for them and, in the parlor with the assembled community of nuns, presented Gospel passages along with his lucid mystical commentaries before heading back to Calvario. 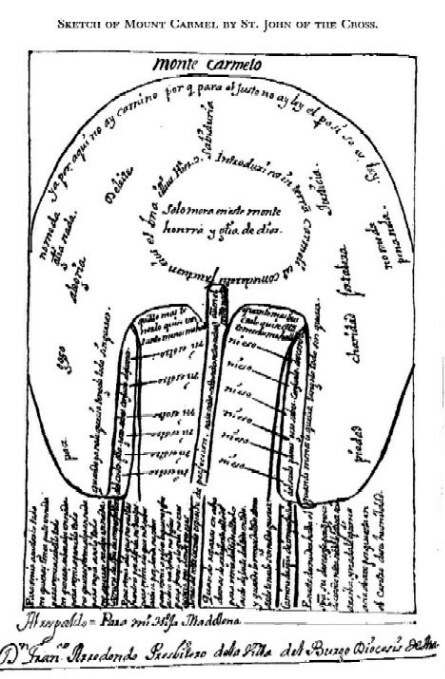 He gave the nuns his schematic drawings of Mount Carmel, with a “map” of the virtues, and corresponding maxims of spiritual counsel. [See image below, with similar image giving the maxims in English translation. ]Nuns made copies of his little book of poems, and he explained the verses with commentaries. In 1580, the Vatican granted the Discalced Carmelites the right to erect their own province, though complete independence and recognition of the two groups, Calced and Discalced, would not come until 1593. Teresa’s reform had been spared destruction. In June 1579 Fray Juan, was appointed rector of the new Carmelite college at the thriving city of Baeza, 36 miles further down the Guadalquivir on a long spur of high land. “He at once found himself caught up in a life of great bustle and activity. Besides teaching and receiving visits, he was much sought after by devout persons of both sexes who were anxious to have him as their spiritual director.” (p. 47) The monks, priests, nuns and laity who had the good fortune to come under his spiritual direction at all these places over the years loved Fray Juan for his profoundly inspirational and clarifying wisdom and his gentle, shy kindness. John, in turn, loved them all, and tended their spiritual development with great attentiveness, a sensitivity combined with candor. He also lovingly tended their bodies, such as during the terrible influenza epidemic of 1580. Yet he craved for more time in silent, formless contemplation of God. He tended to fall into deep ecstatic raptures during this time, and was often concerned that this should happen while saying mass—which it did. He still took time to visit the Beas nuns for several days every few weeks, intoning psalms or singing his own songs along the way. Sometimes he stopped en route to teach the monks at a Trinitarian monastery the art of inner contemplation, also retreating into their belfry to quietly contemplate the lovely countryside and the even greater beauty of God. He also liked to spend days at a time in nature with a brother friar at a small farm, donated to the college, overlooking the Rio Guadalimar. There he meditated, prayed and sometimes sang in the meadow beside a small stream, often long into the night. Such love of nature, notes Brenan, was rare for the city-dwelling Spaniards of that era. Juan was made prior of Los Mártires down south in Granada. He first went to Ávila to pick up Ana de Jesús, who had been designated new prioress of a convent in Granada; here he saw and conversed with Teresa for the last time. Juan, Ana and their party arrived in Granada in early 1582 after a perilous journey and here he stayed continuously for the next three years and much of the next three years after that. He counseled the friars and novices, and, as at Calvario, took them out for long outings into nature, giving talks before each man would find a solitary spot for an hour or two of meditation. Sometimes they had to look for him and tug on his habit to bring him out of his deep contemplative raptures. On feast days he told them amusing stories to make them laugh, a balancing levity for the otherwise harsh life of poverty, deprivation, self-denial and inner focus. John was always on the lookout for any signs of depression in his students, and, though he was rather solemn, he wanted them to stay light and joyous in their Lord. For all his contemplative depth, he was not a quietist, and enacted along with his charges a good amount of manual labor to stay active and grounded—quarrying stone, masonry work, gardening, washing clothes, cleaning the priory, preparing food, etc. As for penances, a standard feature of medieval devotion, he led the way, taking the smallest cell, selecting the lowliest chores like cleaning the latrines, and commonly eating only bread and herbs, letting the friars eat more diversely and supplement this on non-fasting days with chickpeas, rice and a little fish. (The sick were allowed to eat even more to maintain strength.) On Fridays, Juan went around before meals to kiss the friars’ unwashed feet and then, after the meal, obliged them to strike him in the face as they left so he would not feel proud in being their prior. One lighter element from this period is that Juan installed his brother Francisco as mason and gardener and loved to hear him sing the popular love songs that Juan then reframed with a deeper spiritual meaning, a lo divino. It was while taking in the gorgeous views from the spur on the Alhambra hill where the priory sat that John wrote the bulk of his long prose commentaries on his poems, clarifying the way of ego-death, transcendence and union, “participation in God.” These include the twin volumes Ascent of Mount Carmel and Dark Night of the Soul, on the poem of the latter name; The Spiritual Canticle; and a later poem and commentary, The Living Flame of Love. John’s colleagues and disciples recall their mentor to be, in Brenan’s words, “unobtrusive, silent, with downcast eyes that hid the inner fire[;] he looked as if he had no other wish than to pass unnoticed and unconsidered through the world.” He had a round face, big brown eyes, a broad forehead, and aquiline nose, and had gone prematurely bald. Brenan notes how “the extreme introversion and love of being alone which had characterized his youth had been succeeded by a stage [noticed at Calvario, Beas and now Granada] in which he liked to be surrounded by those who were committed to the same road as himself.” At Granada, one of his disciples was Juan Evangelista (d.1638), who became his secretary and traveling companion and one of the better sources of information about John’s habits and character, as was Mother Ana de Jesús (d.1621), who lived with her nuns just a five-minute walk from Los Los Mártires, and whom John visited to hear confessions and give instruction every few days beyond the double grille segregating them for propiety. “The nuns worshipped him,” we hear. “When on one of his … visitations he was admitted to the enclosure, they would fall on their knees and kiss his hands or his feet.” He still traveled from time to time up to Beas and he presided over a new convent for nuns at Málagra. Nearly all these sisters were Castilian. A new DC vicar-general, Nicholas Doria, an authoritarian man, began to vie with Gracián, who still held administrative power, in making certain changes to the Order after Teresa’s passing, changes John did not appreciate (like sending out missionaries to Africa instead of focusing on contemplation of God, and having officers and confessors be appointed instead of elected at the local level), and he argued as such at the chapter conferences at Almodóvar in 1583, and at Lisbon and Valladolid in 1585. At Lisbon, John also presciently went on record to state that one Sor María de la Visitación of Lisbon, a beautiful young visionary claimed by her followers—including high-ranking churchmen—to have powers of healing, bodily levitations, and displays of light during her raptures, and who later allegedly developed the stigmata wounds of Christ, was actually a fraud. John was later proven right about the stigmata. He had always warned his charges to be very careful about any consolations and powers that might dawn, since their source could be demonic. In Oct. 1585, Juan, in addition to his duties in Granada, was appointed vicar-provincial of the order in Andalusia. “He now had nine priories to visit regularly, to which were soon added three more, the most notable being that of Córdoba… Besides these, he had some half a dozen convents of nuns to keep an eye on…. A rough calculation shows that in the curse of these two years he must have traveled over six thousand miles…. Except when his journey was short, he went on horseback.” He mortified himself wearing hair shirts and spiked chains that dug into his flesh, aggravated by travel. For inspiration, he read the Bible or sang from the Song of Songs. He also went into rapture states that sometimes knocked him off his horse. After this grueling administrative post was finished, John returned as prior to Los Mártires, but was soon made deputy vicar-general, second in command to Nicholas Doria, and so he was brought up to Segovia (the Order’s administrative seat) for three years beginning in 1588, and made prior of a nearby Discalced Carmelite house. Juan spent long hours in contemplation here, either at the windows of his tiny cell overlooking the trees and river, or in a low grotto blocked by bushes and brambles on the side of a cliff, or in a garden hermitage, or, on summer nights, just laying under the trees all night long without sleep, listening to the river and songbirds. He shrank from business, sometimes saying, “For the love of God, let me be, for I am not fit to deal with people.” The inner focus on the formless God appears to have taken predominance once again in his life. “It always seemed that his soul was at prayer,” recalled one nun. He was often observed knocking his knuckles hard against the stone wall to bring back an awareness of the body so that he could better relate to the physical world and its human inhabitants. He had much business to conduct—administrative matters, instructing the friars and the nuns at a nearby convent, and writing correspondence (most of his letters, including those to St. Teresa, were later burned by nuns under duress from his enemies). He was only averaging about two hours of sleep each night. John had long been linked with miracles, such as divine fragrances, occasional bodily levitations, clairvoyance, gift of prophecy, control over storms, etc., all of which he tried to dismiss. Now the Divine aromas were often perceived around him, and the friars and local people openly regarded him as a saint. But the prior’s heart remained closed; he repeatedly scorned Juan publicly, refused him visitors, and complained bitterly over the “expense” of caring for him. On the night of Dec. 14, 1591, John humbly begged forgiveness from the man for having caused so much trouble, and the prior, realizing John’s true holiness and his own terrible mistake, wept. At 11:30 that night, Juan joyfully sat up in bed and declared, “How well I feel.” He asked that the 14 friars be called. “The hour is approaching.” They recited some hymns and, at his request, verses from the Song of Songs. “What exquisite pearls!” he declared. They left him alone save for an attendant. The church clock struck midnight, the hour for matins. “Tonight I shall sing matins in Heaven.” This amazing mystic poet, author and spiritual director then folded his hands and stopped breathing. He was dead at the age of 49. Crowds, hearing of his death, came and tore off parts of his clothes and bandages—even some of his hair and nails and a toe—as holy relics, so obviously infused was he with the Spirit of God. The same behavior occurred the next day at his funeral, despite attempts by friars to protect his body. Dug up from the grave nine months later with the intent of sending the corpse to Segovia, his body was found to be undecayed (“incorrupt”) and wonderfully fragrant, like the remains of certain other saints in the Catholic and other traditions. His body was then split up, the relics sent to various Catholic sites for veneration, where they began to display miraculous healing properties. Brenan and the other biographers note that it is actually well that John died early and still in Spain, not Mexico, otherwise his life would have ended in disgrace and both he and his lofty writings would have been almost completely forgotten, damned as heretical. But the collecting of affidavits from eye-witnesses to his saintly life began in 1614, 23 years after his passing, and continued until 1627. The first biography on John was written by a priest in the Order of Discalced Carmelites, Fr. José de Jesús María (Quiroga), at Brussels in 1628, followed by the best of the early works, that by Fr. Jerónimo de San José, OCD, at Madrid in 1641. This priest had collected many of the depositions for John’s beatification. The more notable of the Spanish-language biographies since then are those by Carmelite fathers Bruno de Jesus Marie, OCD (Paris, 1929), Silverio de Santa Teresa, OCD (Burgos, 1936), and, especially, the one compiled by Fr. Crisógono de Jesús, OCD (Avila, 1940). John was beatified in 1675 by Pope Clement X, at last silencing his detractors. He was fully canonized a saint by the Church in 1726, and two centuries later, in 1926, declared an eminent, authoritative Universal Doctor of the Church, as was St. Teresa herself in 1970. These last 400 years, Juan’s poetry and prose teachings on the way of negation (via negativa), the art of formless contemplation, and the spiritual union or marriage of the soul in the Divine Beloved have been highly influential, for both orthodox Christian contemplatives and for those branded heretics (e.g., Illuminists and Quietists). The voice of Juan de la Cruz still speaks to us today of the dazzling glory of God, beyond all forms, images and limits, the Living Flame of Love, the only beatitude and fulfillment for each and every soul.… Those with ears to hear, let them hear. Juan’s three most famous poems are The Spiritual Canticle (39 verses), The Dark Night (8 verses), and The Living Flame of Love (4 verses). John wrote other notable poems and, as mentioned, four books of prose commentary on his three major poems. 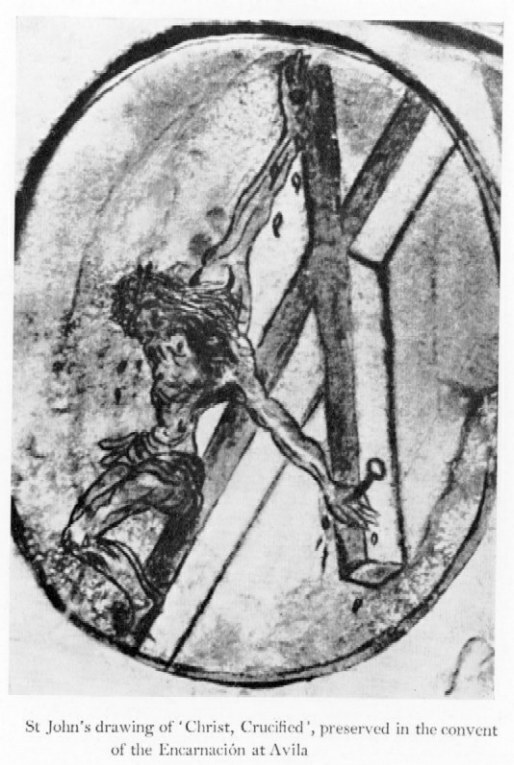 He wrote a few shorter prose items including letters of spiritual counsel, and made some illustrations, too, such as his famous image of Jesus on the cross [see below], and his oft-copied schema on the Ascent of Mt. Carmel (an allegory for mystical spiritual life), composed of maxims for the dedicated aspirants—especially the nuns—under his direction. All his works were composed in the last 14 years of his life, and are filled with wisdom and psychological depth. Influences on John’s theology and mysticism include not just the Bible, on which he was an expert (both Hebrew Tanakh and Christian New Testament), but also Augustine, Aquinas, Bernard, Victor, the Rhineland Mystics who were so inspired by Meister Eckhart of Germany (Tauler, Suso, Ruysbroeck), and the aforementioned medieval Spanish mystic sources. The much earlier figure, pseudo-Dionysius Areopagite (c500), is clearly a major influence, too. Brenan is not impressed by an earlier argument positing Muslim Sûfî influences. Drawing on the work of the distinguished Spanish poet and critic, Don Dámaso Alonso, he thinks the poetic influences on Juan can be sufficiently accounted for by material in the biblical Song of Songs, an anthology of Hebrew folk songs for use at marriage festivals, very influential in the middle ages, and also in the incredibly popular, lyrical and sensual Italian-style Spanish lyrics of Garcilaso de la Vega (d. 1536) and his friend Juan Boscán (d. 1542), both published to great acclaim by the latter’s widow in 1543. In his major poems, Juan uses the same pastoral idioms and hendecasyllabic meter of Garcilaso. And we note that the strong “bridal mysticism” element in John’s poetry was a common religious literary motif in the medieval period for Christian, Muslim-Sûfî, and Jewish mystics (and Hindu mystics in the East)—male or female—going back to early works like Song of Songs and its many commentaries over the centuries, treating sensual-love themes as allegories for the soul’s love of God. Yet the fact remains that the Italian renaissance that inspired Garcilaso and Boscán, and so much medieval commentary on Song of Songs, were in turn influenced by the chivalrous spirit brought back to Europe by the troubadours and minstrels traveling in the Muslim Middle East during the Crusades. And so much of this chivalrous spirit is based on Sûfî themes of sensual love as an allegory for Divine love. 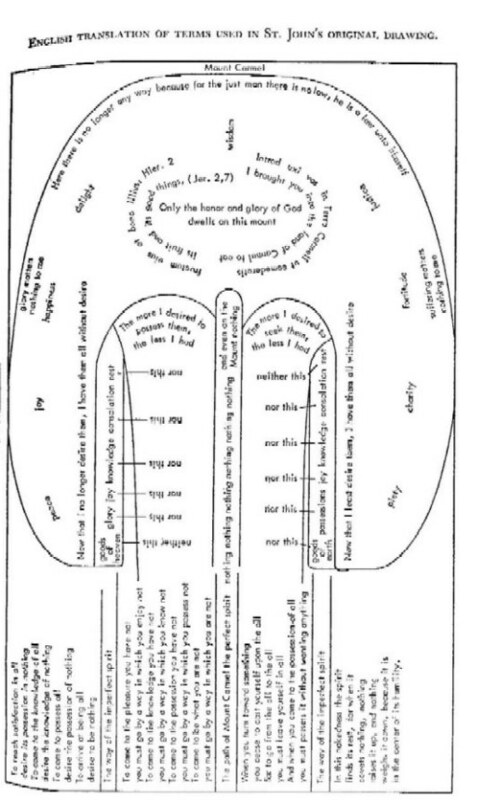 The culmination of this radical via negativa is “becoming God by participation,” a phrase that recurs in several sections of Juan’s prose works when discussing the soul’s perfect union with God. Having been “simplified, purified, and cleansed,” one is unmade and remade in God, through the supernatural power of God’s Love, the Holy Spirit working in, taking over, and utterly transforming the soul. The soul—which we might call in more modern language, the basic individual consciousness—with its powers of understanding, will and memory, is always already infused by God naturally, but now, in authentic Divine union, the soul is supernaturally infused by Grace. There are, of course, parallels to this ego-death and Divine consummation in the world’s sacred traditions—most notably the Muslim Sûfî fanâ “annihilation” and baqâ “remaining” in God, and the much more ancient Hindu Vedânta “neti, neti” (“not this, not this”) moksha or liberation from all that binds, and the unraveling of all “knots of the heart,” so that one spontaneously, egolessly abides as the true Divine Self/Reality, Âtman/Brahman, and all its splendid virtues. And this is none other than the Buddha’s nirvâna, extinction of the selfish self-sense so that only ego-free peace, bliss, compassion and freedom remain, the unborn, undying Awareness—Pure Spiritual Reality, the Absolute. For Juan de la Cruz, this liberated freedom in pure Divine Being is utterly sweet with unspeakable love of God. Clearly, for Juan, God is utterly transpersonal (“God is vast and boundless”), while God is also the Divine persons—Father, Son and Spirit. Transpersonal and personal: a beautiful Divine mystery, unknowable but quite live-able for those who allow themselves to be undone and ecstatically merged in love for the Beloved…. Here are stanzas from each of Juan de la Cruz’s three major poems, in English translation from the Spanish, mainly by Kavanaugh & Rodriguez [click here to buy their excellent 1-volume Collected Works of St. John of the Cross ], with some changes suggested by the Nicholson and the Peers translations. Following these three works are excerpts from miscellaneous other poetic and prose writings by San Juan. [Verses 1-4 from a later poem, The Living Flame of Love / Llama de Amor Viva:] O living flame of love / That tenderly wounds my soul / in its deepest center! ... / Now Consummate! if it be Your will: / Tear through the veil of this sweet encounter! // O sweet burning, / O delightful [consummating] wound! / O gentle [soothing] hand! / O delicate touch / that savors of eternity / and pays every debt! / In killing You changed death to life. [Jesus: “lose your life for everlasting life”] // O lamps of fire! / in whose splendors / the deep caverns of sense [feeling], / once obscured and blind, / now give forth, so rarely, so exquisitely [with strange brightness], / both heat and light to their Beloved. // How gently and lovingly / You wake in my heart, / where in secret You dwell alone; / and by Your sweet breathing, / filled with good [blessing] and glory, / how tenderly You swell my heart [or “inspire” or “kindle” me] with love! [“The sum of Perfection”:] Forgetfulness of creation [unattachment to worldly things], / Remembrance of the Creator, / Attention to what is within, / and to be loving the Beloved. [From The Precautions:] The religious must practice the following instructions if he [she] wishes to attain in a short time holy recollection and spiritual silence, nakedness, and poverty, where one enjoys the peaceful comfort of the Holy Spirit, reaches union with God, is freed of all the obstacles incurred from the creatures of this world, defended against the wiles and deceits of the devil, and liberated from one’s own self…. Have an equal love for and an equal forgetfulness of all persons…. Humble yourself in word and in deed, rejoicing in the good of others as if it were your own, desiring that they be given precedence over you in all things…. Try to practice this more with those who least attract you. If you do not train yourself in this way, you will not attain real charity nor make any progress in it. Prefer to be taught by all than desire to teach even the least of all. [Excerpts from Counsels to a Religious on How to Reach Perfection:] You have not come to the monastery for any other reason than to be worked and tried in virtue; you are like the stone which must be chiseled and fashioned before being used in the building. … Suffer mortifications and annoyances with inner patience, being silent for love of God…. Find genuine humility, inward quietude and joy in the Holy Spirit. … Trials will never be lacking in religious life, nor does God want them to be. Since He brings souls there to be proved and purified, like gold, with the hammer and the fire, it is fitting that they encounter trials and temptations from me and from devils, and the fire of anguish and affliction…. Be constant in your religious observance and in obedience, without any concern for the world, but only for God…. Undertake all things, agreeable or disagreeable, for the sole purpose of pleasing God through them…. Deem everything in the world as finished. Thus, when you have to deal with some matter, do so in as detached a way as you would if it did not exist…. Strive to be incessant in prayer… Whether you eat, or drink, or speak, or converse with lay people, or do anything else, you should always do so with the desire for God and with your heart fixed on Him. Gerald Brenan, St. John of the Cross: His Life & Poetry, Cambridge Univ. Press, paper ed., 1975 (first publ. 1973, drawing on most of the early and later biographies written on Juan de la Cruz in Spanish, and translations of John’s poetry by Lynda Nicholson); Crisógono de Jesús, The Life of Saint John of the Cross (translated from the 1940 Spanish ed. by Kathlene Pond, NY, 1958); Kieran Kavanaugh, OCD, & Otilio Rodriquez, OCD (Ed. & Tr. ), The Collected Works of St. John of the Cross, Washington, DC: ICS Publications / Institute of Carmelite Studies, 3rd ed., 1991 (single volume—excellent value); Kavanaugh, John of the Cross: Selected Writings, Paulist, 1987; and John of the Cross: Doctor of Light and Love, Crossroad, 2000; E. Allison Peers (Ed. & Tr. from the critical ed. of P. Silverio de Santa Teresa), The Complete Works of St. John of the Cross, 3 vols., London: Burns Oates & Washbourne, 1934-5 and Westminster, MD: Newman Press, 2nd ed., 1945 (with excellent introductions and historical contextualizing by Prof. Peers for each of Juan’s work); the major works in this series are available in separate later volumes, e.g., Ascent of Mount Carmel, Garden City, NY: Doubleday Image Books, 3rd rev. ed., 1958; Dark Night of the Soul, Image, 1959; Spiritual Canticle, Image, 1961; Living Flame of Love, Image, 1962; see also Peers’ several other works on St. John, including Spirit of Flame: A Study of St. John of the Cross, London: SCMP, 1943, The Poems of St. John of the Cross, The Character of St. John of the Cross, etc., in various editions and reprints. (Note that Peers and Kavanaugh & Rodriguez have each translated the collected works of St. Teresa of Ávila, too). A one-volume collection of excerpts from many of Juan’s works is by Emilie Griffin, John of the Cross: Selections from the Dark Night of the Soul and Other Writings, HarperCollins, 2004. 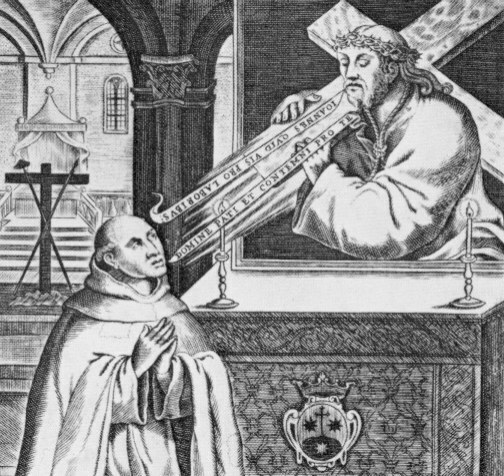 Of recent studies of St. John of the Cross in English, note how some authors want to interpret St. John in a narrower, strictly Catholic light, while others want to see his spirituality in the wider context of a cross-cultural, mystical spirituality. Perhaps the best recent study is Colin Thompson, St. John of the Cross: Songs in the Night, Catholic University of America Press, 2003; another fine study of John (and Teresa) is Keith Egan (Ed. ), Carmelite Prayer: A Tradition for the 21st Century, Paulist, 2003 (by a distinguished Carmelite theologian); other studies include Richard P. Hardy, John of the Cross: Man & Mystic, Pauline, 2004 (straightforward, written for a Catholic audience); Thomas Dubay, Fire Within: St. Teresa of Avila, St. John of the Cross, & the Gospel on Prayer, Ignatius Press, 1989 (by a longtime conservative Catholic spiritual director); Robert Herrera, Silent Music: The Life, Work & Thought of St. John of the Cross, Eerdmans, 2003 (academic work, a bit uneven); Antonio T. De Nicolas, St. John of the Cross (San Juan de la Cruz): His Life, His Poetry (Bilingual), His Prose, NY: Samuel Weiser, 1996 (a new, allegedly more accurate translation of his poetry by a Castilian Spaniard, with a more universalist approach to Juan; includes a foreword by Muslim Sufi scholar Seyyed Hossein Nasr); Mirabai Starr, Dark Night of the Soul: St. John of the Cross (New Translation and Introduction), Riverhead, 2003 (by a teacher of religious studies at U of New Mexico, attempts to universalize John). Numerous other works by modern writers exist, endeavoring to explain the significance of John’s approach to mysticism. On the Muslim Sufi connection with John’s poetry, cited earlier, see Terry Graham, “The Sufi Origins of St. John of the Cross, Sufi, No. 25, Spring 1995, pp. 5-9 (based on work by Luce Lopez-Baralt, San Juan de la Cruz y al Islam, Mexico City: El Colegio de Mexico, 1985, and “The Legacy of Islam in Spanish Literature,” in S.K. Sayyusi [Ed. ], The Legacy of Muslim Spain, Leiden: E.J. Brill, 1994).